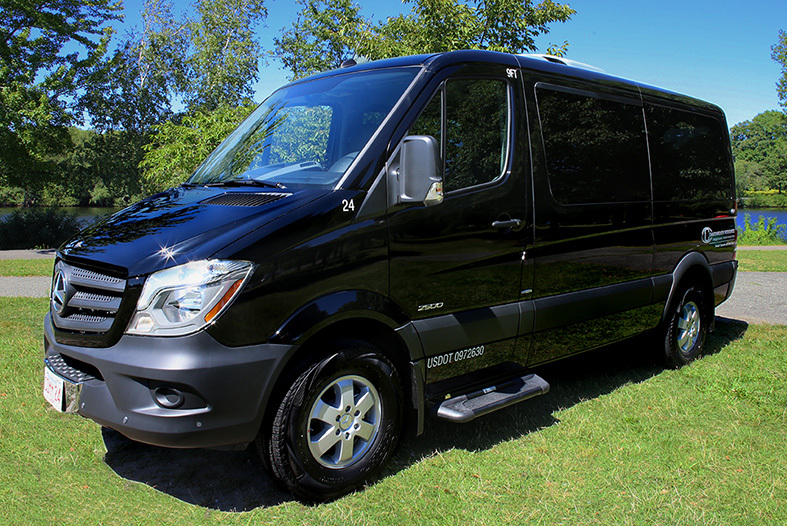 Inner beauty with class-leading space for up to 11 adults, and ample head and elbow room, the Sprinter Passenger Van delivers the ultimate comfort zones for our passengers. Six to ten passengers very comfortably. 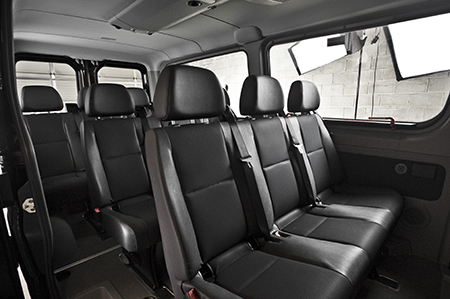 Can accommodate an 11th person in front passenger seat. 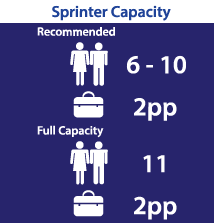 Typically one carry on and one large bag per person. Average passenger assumed to be 5'11" 180-185 lbs. Average luggage size assumed to be bags able to fit in an airline overhead bin. Commonwealth Worldwide stands up to their motto, Anything But Common, and provides extraordinary service...you can trust (them) to handle all of your needs flawlessly. Commonwealth is uncommonly PERFECT! Whenever ground transportation is needed at our company we hit the easy button and lean on you. I have used a lot of companies over the years, but since I started using Commonwealth, they are the only call I ever have to make. I have used Commonwealth services for my corporate access Roadshow needs for over 12 years and have come to rely on them implicitly. - Denise Clarke, Vice President, Corporate Marketing, Keefe, Bruyette and Woods, Inc. The teamwork and internal communication is evident in the smooth coordination of service at each and every level – from reservations to the drivers. You cannot put a price on peace of mind. That is why we use Commonwealth. You guys provide such amazingly stellar service and follow up. I am not sure I could do my job if I wasn't backed by the amazing Commonwealth Team.